Quick Links: BASS BASS BASS Air conditioning R-134a leak - Taco Exterior Suggestions Smittybilt CO2 compact air system, are they worth investing? After Market Mirrors with Turn Signal Lights Help.. Check light, why? Discussion in '2nd Gen. Tacomas (2005-2015)' started by Jm1hawk, Oct 11, 2010. I have pictures in my build. I'm on my phone right now so I can't post them directly in this thread. Yea I do. A lot of trimming, cutting, and grinding was needed to fit them. BajaBumpers was at the Lucas show last weekend and their product looked AWESOME! I pulled the trigger on front and back. The workmanship is first rate. Also, they're setting mine up for use with the stock fenders and a receiver and wraparound on the back. They know what they're doing. Mine will be shipped in a week, sans paint. $1,100 for the pair delivered. wait is OP talking about the brand or the type of bumper in general? Here are some pics with my old bumper. Good question. I assume he's talking about the 'type in general' (lower case spelling), however the brand I bought go by the same name. 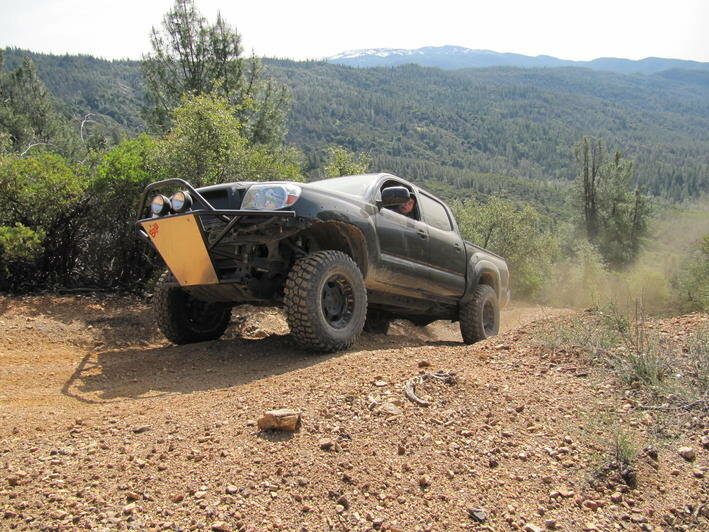 Your bumpers (heck, your whole truck) looks awesome, however like most, I assume yours are welded on, whereas the Baja Bumpers.com ones are bolt-on. Wait u can use Baka bumper with stock fenders right? You have to specify whether you've got stock fenders or fiberglass. If you have the latter, they're 2" longer. I have the stock fenders, but I always thought Blackhawke88's looked so cool (and I've got rubbing issues) that I might go that route. blackhawk are those hankook's with siping i see? how good are they in the wet?